We’d love your help. 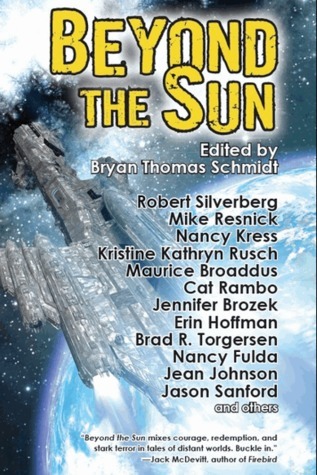 Let us know what’s wrong with this preview of Beyond The Sun by Bryan Thomas Schmidt. To ask other readers questions about Beyond The Sun, please sign up. I'm realy starting to get into sci-fi books and this book has a lot of it in one. The book is a nice mixture of veteran sci-fi writers and newcomers alike, all writing towards the same goal. all I can say is that I'm glad I was offered a chance to read this book. I received a copy of Beyond the Sun because I backed the kickstarter and I popped it onto my Kobo over the week. This is the first story, and it has everything good about science fiction. A brilliant setting, a character with depth and layers revealed as the story progresses, an edge of social commentary, and - frankly - adorable fuzzy aliens! Seriously. I want a pupcat. The story itself has a broad streak of mystery to it, so I can't say a whole lot - but the core of the narrative is a young man who has made his way to a planet known for two things: genetic engineering, and fuzzy cute alien pupcats. His reasons for coming is the crux of the story, but the characters, the setting, and this reason combine for a real treat of an SF story. Loved it. Can't wait to get to more from this anthology. The best science fiction, in my mind, involves not just the romance of technology or a unique setting, but really showing the sociological implications of said technologies or settings. With "The Hanging Judge," Rusch has done exactly those things, adding a great story to Beyond the Sun. Set in a frontier colony where life is hard and the colony sees next to nothing in the way of positives from the taxes they pay, the people of this story have decided that this society - a society where everything is managed by cost-effectiveness and resource utilization - is in dire need of a shake-up. They have a target ready for their symbolic assault - a woman known as the Hanging Judge, for apt reasons. In these colonies, there are small ships that fly out to take prisoners back for incarceration, but they also have the option of using their execution chamber instead - something this woman is known for doing (since prisoners cost so much time and effort and resources). Unapologetic (and unsympathetic), this judge makes a perfect woman around which to make a point, and the plan is underway upon her latest arrival to "deal with" punishment for this distant and poor colony. The story hinges on these various pieces of sociology, economics, and stratification, and it does so in a brilliant way that left me with a very clear picture of just how far this society has fallen. So well done, and such a great idea. I cannot tell you how much I loved the idea of this story - and how Jamie Todd Rubin spins that idea into some really wonderful storytelling. This tale tales relativistic space travel as the core of the idea: when ferrying others to the stars means that - for you - months go by while for others years pass by, how do you find someone to crew and captain these vessels? Rubin's answer to this question? People capable of turning "off" their emotional connections to others. The captain of this tale knows that heading off to a star and back will support his pregnant wife more than anything else he could accomplish - but he will miss this child's birth, and her first years of life even though he will come back in the space of weeks or months. But, capable of flipping his emotional switch off, he doesn't worry about it, feel guilt, or anything else but the wonder of the journey he is taking. But that sense of wonder creates a problem of its own. This story is incredibly well told, as I mentioned, and I really wasn't sure where it was taking me throughout - though at no point did I want to get off the ride. Bravo. Sometimes in really good science fiction, the setting is as much a character as the rest of the cast. This is one such example, set on a world with a very slow rotational period and the resultant exceptionally hot days near the equator. This planet does have, however, abundant clay, and said clay - superheated with mirror kilns in those equatorial areas - makes for bricks, and those bricks mean a local building product with which to continue the process of making this planet a paradise. And criminals are the ones making the bricks. It's a perfect prison - small portable homes for these prisoners are brought with the attendant guard, and they work their butts off, make bricks, and the bricks are sent back. If they run away, they'll just die of the heat and dehydration. The man telling the tale is close to his parole, and realizing that this way of life is about to potentially end for him - and wondering where he can go from there - when another prisoner puts everything in jeopardy. Where the story goes, and how Torgersen manages to evoke some real empathy for the prisoners, is a welcome surprise. And spawned some great dreams. This story from Beyond the Sun was a darkly wonderful one. Here we meet a man who is a descendant of a group of people who fled paradise (ie: Earth) and have lived on a remote and difficult planet ever since. Raised on stories of Earth as the place-that-was (and was beautiful and wonderful), the blurring of religion and history has created a story where those who were not faithful were cast out from said paradise version of Earth, and one day the faithful will be led back. Enter a spaceship touring all the planets were colonies once were, and an opportunity to go out and seek this paradise – and maybe learn that paradise isn’t what it was made out to be. The blind faith in this story is in turns painful and dismaying, but as a core source of strength in the character telling the tale, it’s hard not to empathize with him. This is what he has been told his entire life. How could he believe anything otherwise? As allegories go, it’s not particularly subtle, but I don’t feel it was intended to be so. I really enjoyed the ending, too, which was a bit of a surprise as usually this style of ending leaves me a bit cold. If, on the other hand, you're feeling like an apocalyptic-ish story done well, may I present Dryden's tale from Beyond the Sun? Here we have a people who have fled a horrible Earth with very little to work with, who are now basically homesteading on a new planet. That the new planet has just shown its ugly side - a carnivorous ugly side - that makes things all the more deadly is one thing. That Ann is about to give birth and Edward and she have a lot of carnivores between them and safety is another. I liked this a lot - the tension of the ticking-clock of the oncoming unstoppable horror against the courage of Ann (and the failing courage of Edward) was a nice set up, and the tiny bits of information dripped throughout the tale made the ultimate result feel clever without being contrived. Also, horde of carnivores! This story from Beyond the Sun tells the story of the founding of a new colony world - the very moment the ship lands, the first person off the ship to set foot on the new ground, and the reality that is delivered instead of the lies of the silver-tongued man who led the colonists to their new home. It's a great set-up, and it left me wanting more - I can't help but wonder if this story actually ties in to one of Johnson's many novels and stories (I took a few moments to look on her website). You can tell the world building here is very complete, as even casual mentions of things just have a kind of "sense" to the way they're presented. You might not get the whole idea of what everything and everyone might be, but the total feels whole. This gem of a story is tucked in the middle of Beyond the Sun, an anthology I bumped into thanks to Anthony Cardno - I owe him a thank you - and have been enjoying a story at a time lately on my little trip to read a short story a day for a year. What's done cleverly here is to take something with a strong contemporary cultural presence - in this case, the Amish - and step generations into the future and to a new world and play out that same culture with even more of a drastic gap between the Amish and the world (and technology) that has developed since then. Toss in the tradition of the Rumspringa (don't feel bad, I had to look it up, too) and you've got a phenomenally told story in one of the styles that Science Fiction does so well. The world building here is fantastic (as is the verisimilitude Sandord creates around both cultures) and the crisis, conflict, and ultimate direction of the story had just enough unexpected to it to feel like a surprise, even if you do suss out a lot of what you think might be going on. Again, this collection gives me another name to watch out for. This story comes from Beyond the Sun, and it's wonderful. First off, it's SF with queer characters in a future where no one so much as bats an eye about that. Second, it's about the characters and their mental and emotional state, but the background of the alien world provides the mirror and a physical representation of the character turmoil, and it's done perfectly. Third, it's just so damned smart. I'm not sure I can explain this one without giving too much away, so I'll just give you the set-up and then promise you the rest is phenomenal in execution: it's about a man who believed he was about to make it as a colonist for a settlement on a new planet, but a technological advancement makes him redundant and he loses his spot - only to regain his spot when his partner qualifies for the position, and spouses are included. That he wasn't going to do the same is just one thread in the fabric of their under-strain relationship, and the way this story folds that issue into the ultimate conflict is just so damn brilliant. Speaking of lucky - I'm feeling all the more happy that not-so-random chance (the urging of Anthony Cardno) led me to Beyond the Sun. I keep saying this, but all the stories have really been enjoyable, and - to me at least - quite fresh in their takes on familiar tropes. Take "Inner Sphere Blues." Here we have what I can almost call a "fun romp" of an SF story, except it's about a man, his AI (which is also his ship), and a distress call that's not 100% clear, but clear enough to send him in to the rescue. Before I give the impression that he's a white knight, he's not - one is left with the sense that this fellow is a bit of a drifter and a mercenary, and would be happy to collect a large thank-you reward for his work. But he still does indeed want to do the right thing. Landing on a world where the signs are not good that anything positive has occurred, the story progresses with a kind of slow-build ominousness. From there, however, we ended up in a completely different direction from where I was thinking the tale might go - which is something else I keep saying about this collection. Once again from Beyond the Sun, this short story has a wonderful counterpoint to it - on the one hand, you are in the present, where something terrible is happening on a colony world, and an older woman with a group of frightened children has taken shelter and is keeping the children calm by telling them a story. On the other hand is the story she is telling, which is about the history of the colony, and something that happened to her - something which no one ever speaks of. Until now. To say these two stories come to a wonderful alignment in an unusual way I was not at all expecting would be understating a bit, but it's the character development that Brozek does so well. This older woman (and the young girl she used to be) coexist in the story as the narratives unfold in a way that spoke volumes of world-building without actually speaking volumes. This little gem of a short story from Beyond the Sun has a great core concept to it that is built upon with a kind of dark justice twist that I have to admit I took some delight in reading. This concept is deceptively simple: a colony being planted on a world - but the core reasoning behind it includes a religious doctrine of expanding the reach of said doctrine to new worlds. Sound familiar, what with his being Columbus Day? The voice of the tale is a high-tech psi ops priest, who definitely struggles with the vim of the colonists, but when something with a similar goal as they have comes to the forefront, the character realizes something more than a little bit terrifying: what if there's something out there with a similar mission and a much better ability to succeed? How will we react to being brought its doctrine - assuming we're left alive in the process? This is the story of the colonization of a world deemed "Eden" (and hey, have you noticed in science fiction that any places named "Eden" are so not going to turn out to be good for those who land there?) A woman arriving just in time for things to south (fast) is put in the position of being one of the few to realize just what might be going on. Eden is a world where the plant life is large and plentiful, but other than insects, there's nothing else, really. But what if those plants were something far more worrisome than anything with bones and teeth? Well-paced and packed with a shivery feeling throughout the set-up, the climax hits hard and doesn't give the reader time to pause for breath, right up until the very last words. One thing I think I've said again and again in my trip through the stories in Beyond the Sun is how much I've enjoyed the very different voices and takes on the soft theme of "elsewhere" presented for the whole of the collection. Here, Hoffman doesn't skip this requirement - this is indeed a story set somewhere far from the reach of today - but the elsewhere in this story is as much internal and psychological as it is a physical place. Some of the best world building I've read in SF in quite a while is here, too. Not explained so much as experienced through example and natural conversation, this place - and the people we are watching in this place - have the technological ability to recreate simulations (for lack of a better word) that are enticingly real. Could you resist the lure of a companion that lived just for you? Would you even try? What if it was so a piece of your own mind, once experienced, that not going ahead with it was near impossible? It's a wonderful story, and the kind of story that SF can do so incredibly well. I'll be hunting down more Hoffman. One of the best things about Beyond the Sun is the wide variety of "other worlds" visited in the anthology (which is the loose theme). One of the other best things about the anthology is how often these other worlds are defined by a culture that is reminiscent of something we have, only with a few facets seen through the speculative fiction lens. Something that comes up in quite a few of the stories - as a non-issue, mind - are the non-heteronormative relationships. It's handled perfectly in many of the stories (including Cardno's) in that it's not handled at all. A fellow mentions his husband, and no one so much as bats an eye, and the story progresses. Y'know, how it should be. Anyway, moving past that small point (which I love), Cardno's tale is a solid story of a colony that has been too-long ignored by Earth, and their one connection - via a satellite - to Earth is in danger. When a group go into orbit to try and rectify what's wrong, a greater truth - and a potentially greater disaster - are waiting for them. I loved the "day in the life" of this story, as well as the larger culture and society hinted at for this world. I've been saying this a lot with these stories, but I'd love to revisit this planet and these characters to see them again. This story, from Beyond the Sun is one of the most deftly done "human realizing something awful about an alien culture" stories I've read in ages. Even better, it's nowhere near as simple as that, and has layers that peel back multiple times within the same narrative. When humanity landed on a planet with herbivorous native four-legged (and somewhat simple) sentient life on it, they struck a deal to ensure they didn't intrude on their culture, but when an accidental recording of the death (and death ritual) of one of their species comes to the attention of an anthropologist, he realizes a dark truth about these simple and benign creatures, and feels the need to tell them the truth. But, the truth is never quite what we expect, no? After this story, I'm only one more story away from the end of Beyond the Sun, which is a little saddening, but I've really enjoyed the ride, so the greater positive exists. If you're at all a fan of SF, I could already have told you this collection is worth it, but today's story was yet another checkmark on the "buy the book" column. Taking Jewish heritage and spinning it into a science fiction short story set on another world where intelligent alien life exists is already a decent idea, but to do so and spin the notion of a Dybbuk - a spirit whose guilt from actions in life prevents them from moving to the afterlife - and this alien race intersecting is just marvelous. When a man who has passed on finds himself in the green furred body of one of these aliens, the cold shock of the reality of this situation to the narrator - especially as a not-particularly religious Jew - is heavy. There's a sly humour to this story as well as a decent dose of social commentary about the sometimes overly strict (and sometimes overly lax) world of religious belief, and I have to say Silverberg led me through this story in a way that left me with a wide smile on my face. Beyond the Sun closes with this fantastic - and damned funny - story about an imminent alien invasion force and a single alien observer who is watching us to see what sort of resistance to expect when they assault us and take our planet. They send an asteroid from the belt toward Earth and wait to see our reaction to that, as well - and it makes a great test of our planet's firepower. Then the observer starts his journey through our culture, and soon realizes that all is not as it seems on this placid little blue and green marble. Fans of Science Fiction pop culture will have a blast reading this story, where the observer discovers reason after reason to worry about invading Earth (there are Kirks who seem unbeatable in space-battles!) and the asteroid's uninterrupted journey toward the Earth makes the alien more and more convinced that something is just plain off about these Terran people. It was a great way to close off an anthology that I truly enjoyed, and I'll be looking for more work from this editor and the authors he gathered. Bravo to all concerned. A solid anthology of alien worlds with some excellent stories. The best are by Nancy Kress and Kristine Kathryn Rusch. Other standouts come from Jamie Todd Rubin and Autumn Rachel Dryden. There are a few disappointing stories but overall this is a worthwhile addition to any SF library. I've read it and enjoyed each and every story in it. You won't be disappointed with this anthology. It is much fun. I got this book through the FirstReads program and I was excited to see what would make it into this collection. I'm not usually a big sci-fi reader. Fantasy is more my thing, but I enjoy sci-fi as a genre onscreen, so I thought I might see some fun stuff. Overall, the collection felt boring and stale. There were a few moments when the creativity really shone through, but I stalled out a few stories from the end because they just weren't grabbing my attention. I'm grateful for the chance to try so I got this book through the FirstReads program and I was excited to see what would make it into this collection. I'm not usually a big sci-fi reader. Fantasy is more my thing, but I enjoy sci-fi as a genre onscreen, so I thought I might see some fun stuff. This is a good collection of SF short stories. Good diverse collection within the theme of space colonization, covering many different aspects and in many different styles. And surprisingly, every story was new to me, even the older one from Robert Silverberg.